This chapter provides a subjective discussion of the state of the art in attitude determination and control and identifies specific problems and areas in which information or further development would be valuable. The major changes that will effect future mission profiles were described in Section 1.1. The most important of these are increased spacecraft autonomy and launch via the Space Shuttle, which will substantially increase the volume of space activity and somewhat reduce costs. (Sixty shuttle launches per year are anticipated from 1984 onward.) In addition, accuracy requirements are becoming increasingly stringent, as illustrated in Fig. 22-1. Thus, the major requirements for the 1980s are to handle increased data volume and to obtain greater accuracy at reduced costs. 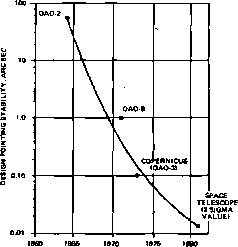 In contrast to orbital mechanics, the area of spacecraft attitude determination and control has developed almost entirely in two decades, so much of the fundamental work remains incomplete. 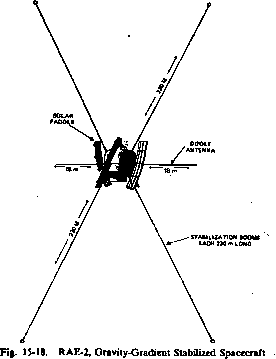 For example, there is no geometrical analysis of attitude accuracy for three-axis stabilized spacecraft comparable to that discussed in Chapter 11 and, although orbit determination hardware and measurements have become at least somewhat standardized, attitude determination hardware and measurements have not; there is no clearly superior measurement type or generally accepted standard hardware or analytic techniques.